Earlier this month, a super nice someone left some goodies on our doorstep. They didn’t even knock. Or if they did, we weren’t home. Or maybe we didn’t hear it. I went outside to throw something in the garbage can and sitting on our steps was a huge red stocking! It was filled with fun books for the kids and an envelope. Underneath the stocking was a plate of scrumptious muffins (I’d love the recipe), along with some cute handmade ornaments. The outside of the envelope read Happy St. Nicholas Day!!! And inside the envelope was some money. I’ve been trying to figure out who did this because I want to thank them. But I know I won’t ever know. So I thought that I could thank them on my blog. You know, just in case 1 of the 2 people that read my blog happen to be the person who did this, or know the person who did this. So, thank you so very much! You are very thoughtful and sweet. As I’ve thought about this, I realized that the person deliberately wrote “Happy St. Nicholas Day” and not “Merry Christmas” or “Happy Holidays” or something else people usually say. So I googled it. And guess what? It’s a holiday celebrated in Europe on the 6th of December. Some also celebrate it in the United States. And I believe our surprise was delivered on December 6th. How fun is that? So thanks again Somebody, for the great surprise. 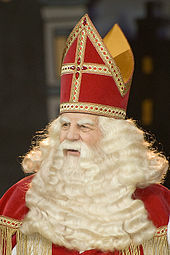 This entry was posted in Holidays and tagged St. Nicholas Day. Bookmark the permalink.